Babies are delicate little gifts that come into our lives and change them overnight. When you have an infant no larger than the length of your forearm, you want to be there and protect them from any possible harm, illness, or danger. So, when that tiny muffin’s nose gets clogged, you are left feeling so helpless and miserable. Luckily there is an easy fix for something like a blocked nose. Aspirators essentially utilize suction to draw out booger from the nasal passage to alleviate pressure and improve breathing. 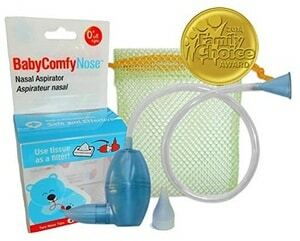 We bring you some of the best baby nasal aspirators that have been in use by parents to relieve their infants and toddlers of snort and nasal congestion. Breathe a sigh of relief along with baby because Frida Baby Nasal Aspirator is one of the best nasal aspirators. What you get with Frida is a non-invasive product that is endorsed by pediatricians. The product is a safe, BPA free and phthalate free device with disposable filters. It creates a seal towards the outside of the nostril for seamless cleaning. The device comes with 20 extra hygiene filters. It is easy to clean and is dishwasher compatible for use on the top shelf. It is easier to use on infants and toddlers and may not be very handy if you have an older child because you need less movement from the child for the suction to work. 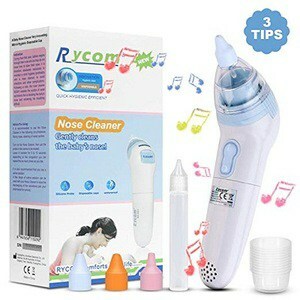 Because of the design and the power of the suction, you will find that a lot more nose booger can be removed easily. You will like how it is safe and non-invasive for baby. 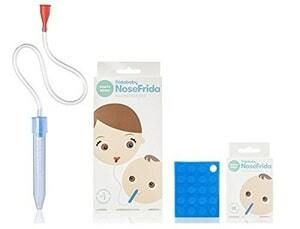 You could make cleaning time a little game of boogie hunt with NoseFrida. 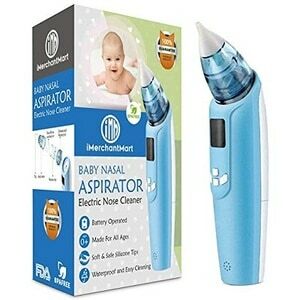 This nasal aspirator from iMerchant Mart is the dream aspirator with sassy features that can entertain your little one while you clean the pile up inside the nose. The device is a battery operated electric nasal aspirator with a soft silicone tip. It comes with three levels of suction power. It is waterproof and is easy to clean and carry around. Additionally, it has two sizes of reusable silicone tips and tweezers for cleaning purposes. It comes with an LCD screen, lights, and soothing music to get your baby’s attention. The product is free of BPA and phthalates. The price may seem steep to some parents, but the product makes up for it with its performance. You will be elated knowing that this nasal aspirator comes with a 90-day refund guarantee. It also comes with a warranty of 1 year on performance and durability. Nosiboo Pro is a device that has been developed in association with ENTs to give you the full benefits that come with the advice of a medical practitioner. Nosiboo infant nasal aspirator comes with a fun-looking design that catches your infant’s curiosity. It is BPA and phthalate free. It is also incredibly easy to clean and maintain. The nasal suction power has been set after consultation with otolaryngologist and is tremendously safe for children. It has a patented head known as Colibri head, which is the only portion of the device that requires cleaning after us. It makes a slight buzzing noise akin to a vacuum cleaner, but not as loud. 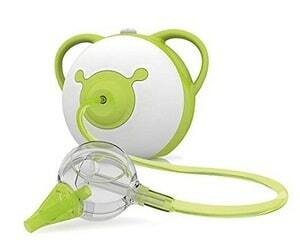 The nasal aspirator is made keeping in mind your infant’s restlessness through a bout of cold. Each child has different needs during an illness, but the soft silicone head and child-friendly design help alleviate your baby’s anxiety. Are you one of those mothers who are tired and frustrated with a manual aspirator? FMK brings to you an electric aspirator that puts the fun into an otherwise stressful nose cleaning activity. This nasal aspirator is the best snot sucker for baby. It comes with an LED display, colorful lighting, calming music, and an ergonomic design. It produces the precise quantity of suction to work on removing stubborn snort. It is BPA free and is FDA approved. The FMK aspirator comes with three levels of suction power. It comes in 3 sizes of reusable, soft silicone tips to fit specific requirements. Suction levels and music volumes have the same controls and can take you some time to adjust to them. The aspirator comes with a saline dropper that helps fight dry booger. Never again will you have to poke and tweeze the dry build-up and exasperate your baby. BabyComfy is an excellent snort sucker. It is very helpful with coagulated, wet booger and dry snort. The nasal suction helps to remove mucus in the nostrils without causing discomfort to your little angel. This aspirator has a unique tissue filter system as against foam rubber filters. It enables parents to use household tissue as a filter against the mucus and the germs. The product includes two soft tips for the nostril. It comes with a mesh pouch to make it convenient to carry around. The device is dishwasher safe and is free of BPA and phthalates. Some parents may find it hard to manage the device without additional help. Parents who are concerned about your environment will be happy with tissue filters that easy to source and are bio-degradable. The entire kit comes with spares, just in case you misplace one of those teeny tiny parts while taking care of your precious little one. Parents can have a trying time when their babies are under the weather. Our list of nasal aspirators makes your work a tad bit more manageable. With one of these listed aspirators, you can take a tedious task and make it hassle-free. You will have one less chore out of your way while using these safe, hygienic, and handy nasal aspirators.